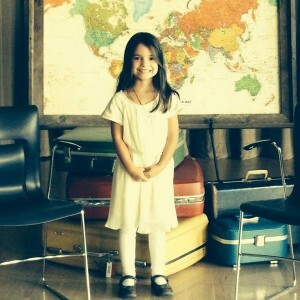 For this edition of Ava’s Around the World Lunch we’re heading to Greece with mezze. 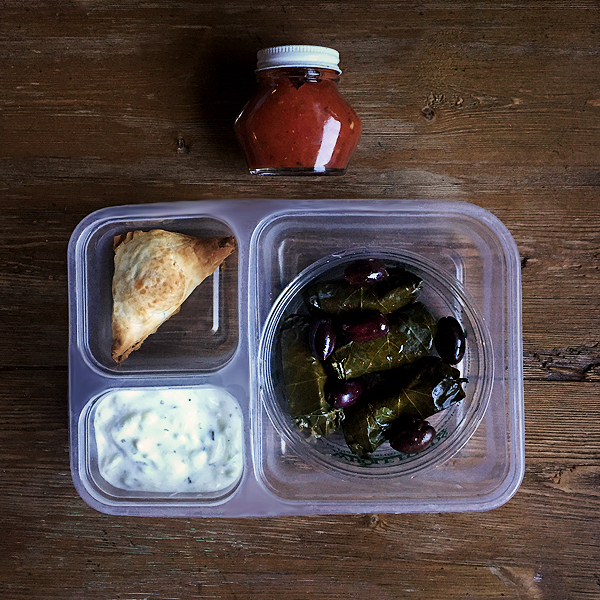 If you play your cards right, the flavors of Greece can be in your child’s lunch box in less than five minutes. Tucked away in my pantry is my greatest quick-fix secret: stuffed grape leaves, a.k.a. dolma. Sure, I’ve been known to make dolma. I happen to LOVE making them. But sometimes I’m in a hurry and need to grab something quick for my daughter’s lunch. While I’ve found dolma at grocery store salad bars, I don’t always think far enough ahead to grab some. 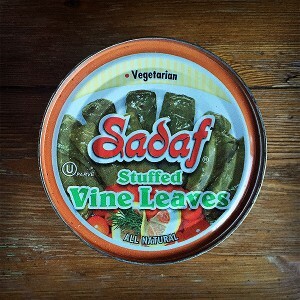 Thankfully our local Middle Eastern market sells dolma in cans for $3.99. There’s well over a dozen in each can. While not the same as homemade, they still have the same great pop of lemon and rich olive oil. They’re great to have around for hectic mornings! Serve with pitted olives and a little tomato sauce for dipping, just like the do in Greece. Is it Greek without Spanakopita? I don’t know, but I don’t want to find out. This is another recipe you can make ahead and freeze, or simply keep a store-bought box of frozen spanakopita on hand. In the morning, while little ones are getting dressed and eating breakfast, bake off a few. For an even quicker fix, make homemade spanakopita for dinner the night before and save a couple for leftovers. Try not to eat them all before you pack the lunch! For a salad, I made a small bowl of tzatziki. Just stir together a cup of plain yogurt, one clove of crushed garlic, a teaspoon of mint, and half a cucumber that’s been peeled, shredded and squeezed dry. A good sprinkle of salt pulls all the flavors together. This is the only item in the mix that can take a few minutes to prep – and it can easily be made the day before. Plan ahead. Make the dolma for a party on the weekend. Here’s an amazing recipe from Qatar and here’s another, more unusual version from Armenia. They keep for at a good week in the refrigerator, so you can easily set a few aside for lunches. Not in the mood for tzatziki? Swap the yogurt salad for a traditional Greek salad. Remember, this means no lettuce! Need a protein boost? Try meat-filled dolma. You can make or buy ones stuffed with spiced lamb or pork. MMm I love dolma!! Where is the middle eastern market in Tulsa? I got this at “Jerusalem Market ” near the post office at across from the Farm Shopping Center (behind QT). Thanks for the tzatziki sauce recipe! I never knew how to make it but have had it on gyros at restaurants and loved it! I had no idea it was so easy!